WEST YELLOWSTONE, Mont. — Blue sky, whitish rock-sheet land, milky blue pools and the dark green forest in the far end – a fantasy-like scenery was what I saw when I stepped into the Porcelain Basin of Norris Geyser Basin area at Yellowstone National Park. A Norris Porcelain Basin overview (Photo by Siyuan Tong). To make this even better, the picture was not stilled. 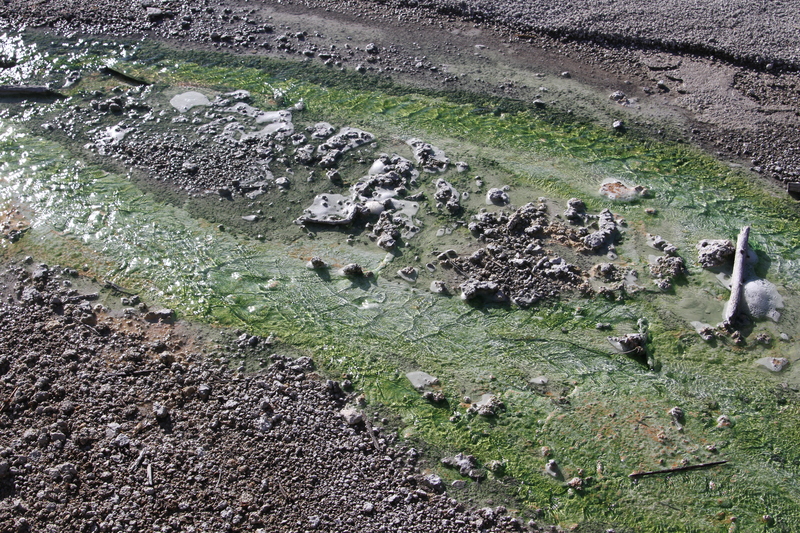 Hissing steam from fumaroles and the sulfur smell made this alive, and ultimately more attractive. Yes, the sulfur smell could not count as something enjoyable, but when it was put into the context of Norris, it fitted well with the whole volcano background. It was hard for me to believe that such an amazing place was not that popular compared to other tourist hot spots like Old Faithful and Mammoth Hot Springs because I was lost in the beautiful rainbow colors on the ground. At the same time, I had a very complex feeling. On the one hand, I wished it could be continued so that next time, when I walk on the beautiful trail again, I can enjoy the quietness and get even more connected with nature like I did this time. There were not many people present when I arrived at Norris, not at all compared to the large crowds at Old Faithful. The entire Norris basin area was relatively quiet. I could hear the birds singing, the subtle sound of the steam, the boiling bubbles in the hot pools and even the whisper of the wind. There were other people, but they were at distance from me. At a given moment, I could almost feel that there was only me and the whole place belonged to me. That was solitude, I suppose, and I enjoyed that. Turquoise color on the ground at Norris Basin in Yellowstone National Park (Photo by Siyuan Tong). Maybe because I am more of an introvert and I love being alone, the Norris visit was just perfect for me. I could walk slowly along the trail, stop as long as I want to get a close look at those pretty colors on the side and take as many pictures as I need. No crowds were pushing or bothering me and I did not have to hurry to anywhere. However, on the other hand, I wish every visitor could see this gorgeous view and feel the same peace like I did. Unfortunately, it seemed hard. When was asked why she did not feel peaceful, her friend Donna Robinson answered. “Well, this place just reminds me that we are on a volcano and, if it erupts, we can be all dead. Ha ha, this is probably why we are friends. We feel the same way,” Robinson laughed. “Yeah, it is interesting, but …” Beck added. I was at a loss of words after talking with Beck and Robinson, but it is true that Norris is part of one of the world’s largest active volcanoes. In fact, it is because of its location plus the fact that it sits on intersection of three major faults that this unique landscape is formed. 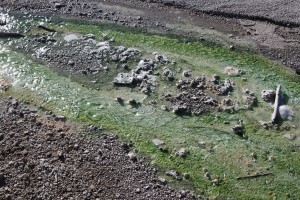 Norris as one of the hottest and acidic of Yellowstone’s hydrothermal areas is constantly changing and therefore unpredictable. 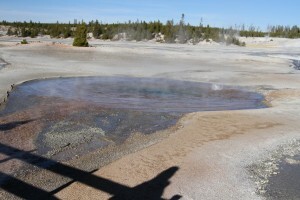 New hot springs and geysers appear each year, and heat-loving-microorganisms-caused colors vary during the time as well. Therefore, it is definitely somewhere worth a second visit and will probably give me a fresh look next time. I missed it already when I learned those facts before I left. Allis Bellingham, a Yellowstone area local who lives 60 miles away, obviously felt the same way as I did. It was her 65th visit to Norris when I met her. Though geysers in Norris became unpredictable in recent years, if you are patient enough, you will see it. 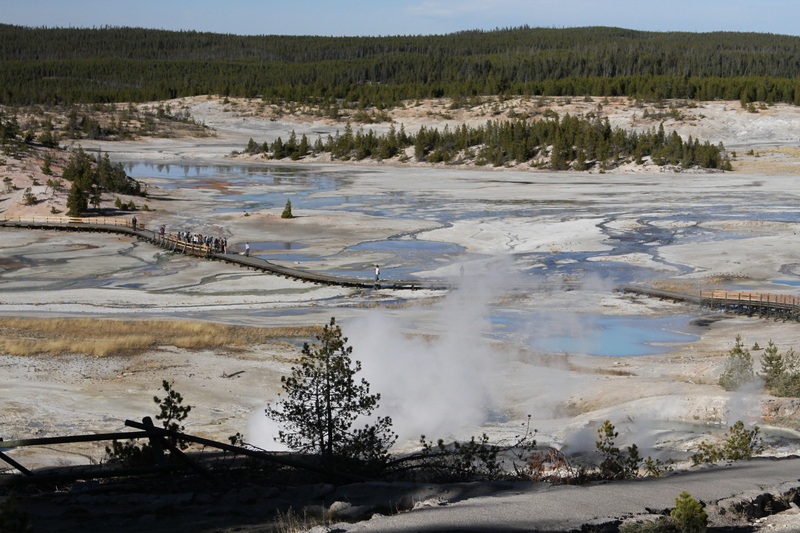 A bubbling hot spot at Norris Basin (Photo by Siyuan Tong). As I was talking with her, the geyser in front of her started bubbling, though it did not become a real eruption, it was still exciting. About three minutes later, another geyser in the back and far from the trail started erupting as well. Though the size of the eruption of water I saw was far smaller compare to the main one in Old Faithful, seeing an eruption in the mist of such a colorful place was a special experience to me. By the time I had to leave, Bellingham was still there, waiting for another eruption. She said she planned to be there for eight hours. Actually, I quietly wished I could stay longer as well. No matter how other people view Norris, it was always a fantasy to me. I did not think I would be bored staying there for hours. If you have some time while visiting Yellowstone, and you want some rest, try Norris. It will not let you down. Directions: From Yellowstone West Entrance, drive straight to the Madison Junction, then head north on the main highway for 13.3 miles until you reach the Norris Junction. Make a left turn and follow the road into the parking area. Look for the walkway on the west end of the parking lot. 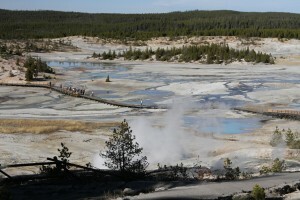 Museum: Functions as the visitor’s gateway to the Norris Geyser Basin. Have exhibits explaining geothermal activity and life in thermal areas. Open during May through September, 9 a.m. to 6 p.m. Trail length: There is a 1.75-mile trail for the Porcelain Basin. There is a 1.5-mile encircled trail in Back Basin. Facilities: Restrooms, designated accessible parking, museum and campground.